I hope you all had a great weekend!! We are still having an amazing time in Maui! 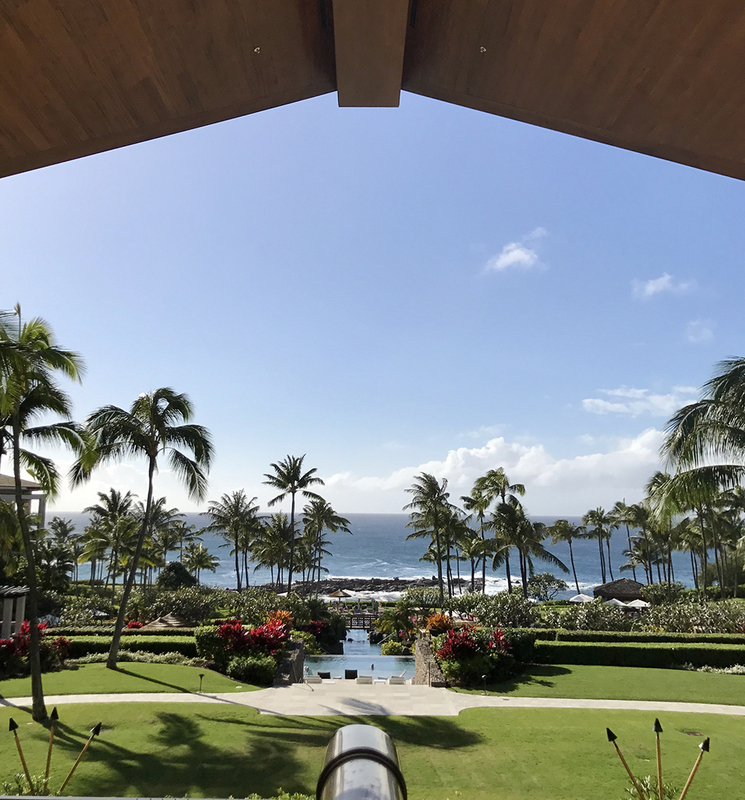 This is our first time staying at the Montage Kapalua Bay and we have LOVED it so far. It’s super kid friendly, by far the most kid friendly hotel I’ve ever stayed at. The pool area has a huge shallow area for the kids to swim around in that is completely separate from the adult pool, so you don’t have to worry about bothering anyone. Isla loves splashing around with her cousins and the poolside mac & cheese is her favorite (the chick knows how to enjoy a good meal! ;). The beachfront view is absolutely gorgeous (a view I don’t think I could ever get sick of) and a couple days ago we woke up to the prettiest rainbow I’ve ever seen! While here we’ve had the opportunity to do fun things like zip-lining and spend an afternoon at the spa, which was SO relaxing!!!. 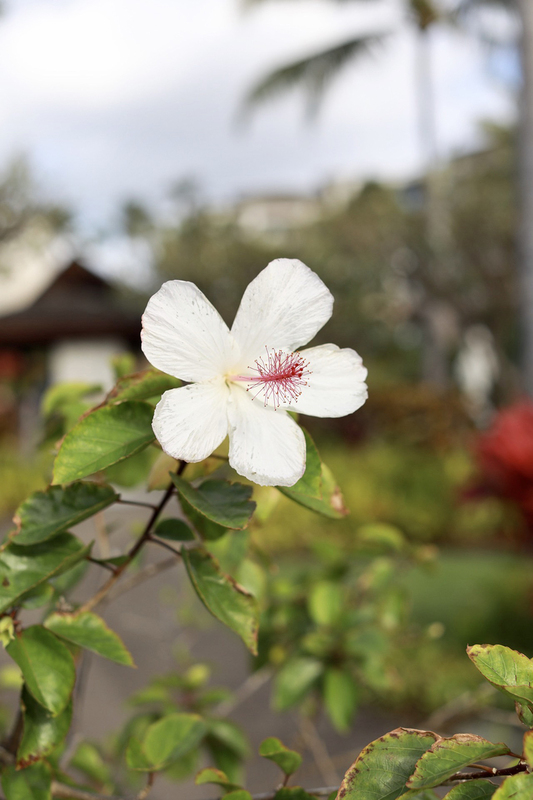 We were also able to experience the Hawaiian lifestyle and culture with a Lei Making Class from a cultural ambassador from the resort (you can see the lei I made here). Be sure to follow along on my Instagram (@rachparcell) and Snapchat to see more of our adventures this week before we head back home to 20 degree weather!!! Super adorable beach time outfit! I like all of the photos too! Your dress is so cute! It definitely looks like paradise there! Such a fun dress! Hawaii looks amazing! Looks so beautiful there! And I love your bag, perfect for a tropical vacation! This is so beautiful! Love the photos! And your sandals are adorable! Sounds like an amazing vacation! Love your dress! I love that yellow Celine bag, it looks so good with the black dress and it’s a perfect color for a tropical getaway! Thanks for sharing, beauty, and I hope you continue to enjoy your stay! I’m so jealous of your Maui adventures and all the snaps really make me miss the warmer weather! Your trip looks beyond dreamy!! Have a great rest of the week love! Definitely paradise. I’ve never been to Hawaii but of course I would love to go sometime. I’m loving your tan girl! Love this dress! You look fantastic and love the pop of yellow with the bag! Looks like you guys are having such a blast. You’re amazing to travel with two young kiddos. You make it look easy while looking gorgeous at the same time. Sounds like you’re having the most amazing time! Love your off the shoulder dress! I love this dress it looks like the perfect beach cover up. Maui looks absolutely gorgeous! I have been following on Snapchat and it looks so fun! It is always so sweet to see your little ones in some of these happy moments. Thank you for sharing, I love following along! You look so pretty! Hope you are having an amazing time. Ooooh, I’m loving that cover-up / dress! I live in Florida so anything that is both appropriate for the beach/pool and then also to lunch, shopping, strolling around is ideal. to lunch/strolling is ideal. Love it. It’s also a very flattering cut. These pictures are so beautiful! Your dress is so cute and you look amazing! Thanks for sharing!! What a stunning place and view! Such a cute look! I also went to Maui for the first time this year and it was amazing. Glad to see you are having a great time! Did you love it?! We come every year and seriously can’t get enough!